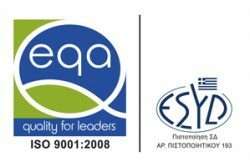 Aegean Electronics maintains a quality management system in conformance to International Standard EN ISO 9001:2015 which is certified at regular intervals by QMSCERT through the Hellenic Accreditation System (ESYD) for Trade and Support of Marine Electronic Equipment. Aegean Electronics has been approved and certified by the Greek Authorities (Ministry of Merchant Marine, Branch of Commercial Ships’ Surveys) as a Shore Based Maintenance (SBM) Provider for Global Maritime Distress and Safety (GMDSS) equipment as mandated by SOLAS Regulation requirements. Aegean Electronics is also officially enlisted, according to EU Directives and National Laws, in the Company Registry for Maritime Services and Repairs at the Regional Development Directorate through the Piraeus Chamber of Commerce and Industry (PCCI).